On the famous temple of Esculapius, the Greek god of medicine, once the centre for pilgrimages of sick persons, rises the church of St. Bartholomew of the Island. The Ponte Fabricio, erected in 62 B.C. 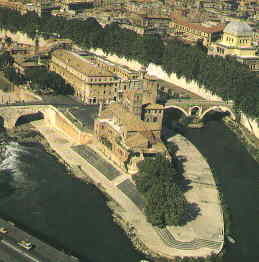 still almost intact today, and Ponte Cestio (46 B.C.) unite the island to the city.